In the largest study of ancient human DNA ever conducted, an international team of scientists has revealed the complex story behind the defining periods in European prehistory. Professor Ian Barnes, a co-senior author of the study and a molecular evolutionary biologist who works with museum collections, archaeological and paleontological material at the Natural History Museum, will be revealing the fascinating and sometimes unexpected stories of our ancient ancestors as told by their genetic fingerprints. 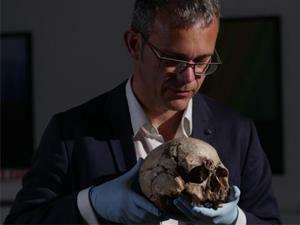 The talk will discuss results from the ground-breaking, international project including details of the first ever full DNA analysis of Cheddar Man and the revelations of almost complete population change in the Early Bronze Age. Prepare to have your ideas about British Prehistory challenged or even changed completely in this intriguing presentation.